Walls of Tarraco, at Tarragona. An outstanding building because ot its facture and its state of preservation among those remaining from Republican age. 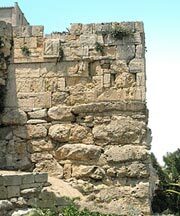 This wall was built betweem 3rd and 2nd centuries b.C. 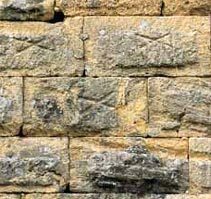 The most original from them is mixture of Iberian and Roman constructive elements and use of different techniques used at each phase. Today, more than 1.300 m. are kept in a good state. First phase -3rd century b.C.-, shows big ashlars roughly carved -some cyclopean ashlars are more than 4 x 1m.-, as a plinth; 6m. high and 4,5m. wide. It is composed by two walls made of these big ashlars filled with rubbish and stones. At a second phase, at 2nd century b.C., its perimeter was made wider and higher. Lesser ashlars, some of them slightly padded and well carved, "opus quadratum" were supported on a megalithic base being up to 11 m. high. 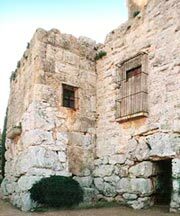 It is composed, as at prior phase, by two parallel walls with a separation of 4,5 m. filled with masonry, fit adobes, stones and lime, with transversal braces of 10 m. long each one. 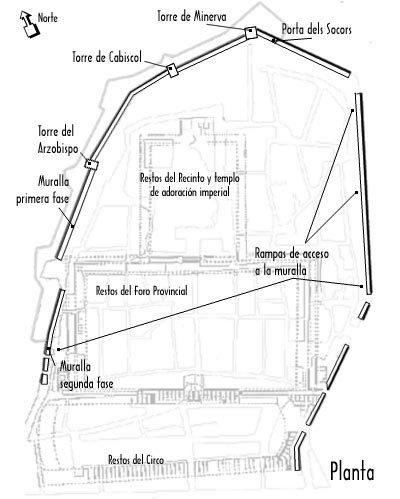 Access to the upper section of the walls was made through several slopes. Remainings of three are kept. 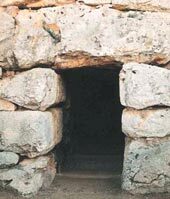 At the sides ot the walls there were doors and six little lintel accesses. 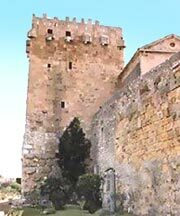 Sometimes there are defensive towers at the most delicate points: tower of Minerva, of Cabiscoland of Archbishop. These towers have been lately modified, specially Archbishop one. Tower of Minerva is the most important of all, since it was built at the first phase. It has a cyclopean stones basement with ashlars on it. They form their walls. Inner room is an almost square chamber with 7,50 m. long at each side and two little cavities as sagittariae and two doors communicating with the inner part of the city and with access to Cabiscol tower. It is placed at a corner of the wall. There are many representations carved on their ashlars: five heads on the plinth and an image of Godess Minerva on a relief at the upper zone. There also many inscriptions with allusions to divinity made at 3rd century b.C. They are probably the eldest at the Peninsula. Close to them stands the one door preserved from this age: it is the "Porta dels Socors" -semicircular arch-, with a clear pseudo-religious function as it was an access to the city. Later, this wall was amplified, without towers. It conditioned evolution of urbanism, marking an improvement. Walls were used and restored at several ages, being partially spoilt as their ashlars were used as quarries for other constructions.